FILE - This Oct. 25, 2011 file photo shows the logo of Swiss pharmaceutical company Novartis AG on one of their buildings in Basel, Switzerland. Novartis AG on Thursday, Oct. 25, 2012, reported a net profit of $2.48 billion during the third quarter, with income remaining flat as new drugs offset patent expirations. The Basel-based company's profits between July and September were virtually unchanged from $2.49 billion in the third quarter of 2011. (AP Photo/Keystone, Georgios Kefalas, File). 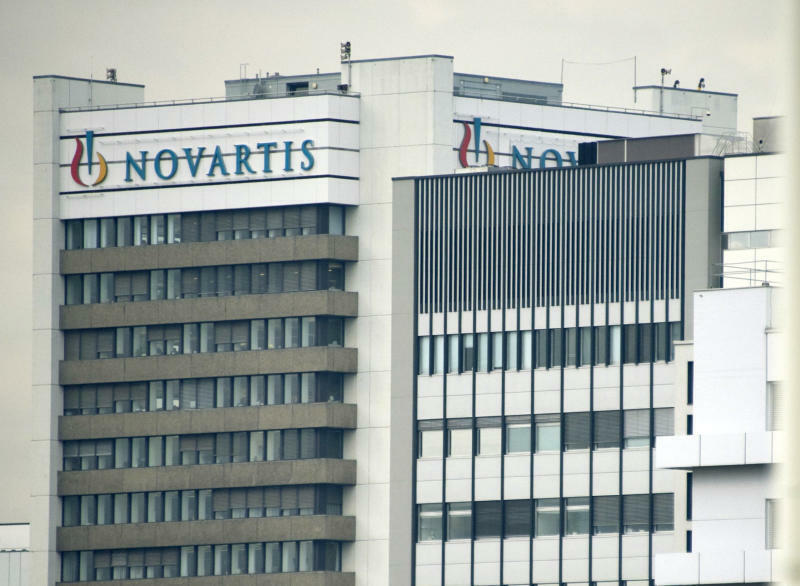 BERLIN (AP) — German authorities ordered a recall Thursday of some batches of Novartis flu vaccine as a precautionary measure after the company reported the appearance of small particles in the manufacturing process. The Paul Ehrlich Institute, which is part of the country's Ministry of Health, said there had been no reports of particle formation in Germany or of any serious side effects during the current flu season. "However, in the interest of risk prevention and consumer safety it is necessary to cancel the approval for certain vaccines, since the formation of particles in the vaccine and therefore the risk of serious side effects cannot be ruled out," Institute President Prof. Klaus Cichutek said in a statement. The decision affects four batches of the influenza vaccine Begripal and one batch of Fluad. It does not affect the seasonal vaccine Optaflu. Italy's health ministry banned the sale of four Novartis flu drugs on Wednesday. These included Fluad and Begripal — sold as Aggripal in Italy — as well as two others: Influpozzi Adiuvato and Influpozzi Subunita. Switzerland's regulator Swissmedic also suspended deliveries of flu vaccines from Novartis as a preventive measure. Britain's Medicines and Healthcare products Regulatory Agency said there was no evidence yet to pull the vaccines off the market but added it was gathering further information on the Novartis vaccines. The Swiss pharmaceutical company said Thursday it was cooperating with the Ministry of Health in Italy, where the vaccines are produced, and was committed to providing vaccines to patients for the current flu season. There had been no adverse effects reported so far from more than 1 million doses of Agrippal/Begripal and Fluad administered, the Basel-based company said. "Novartis confirms that these particles can occur in the vaccine manufacturing process and is confident that there is no impact on the safety or efficacy of the vaccine," it said in a statement.